Awareness of the importance of a properly functioning locomotor system to bovine health and welfare has increased around the world. Several countries have recently introduced electronic systems to routinely record foot and claw disorders in dairy cattle and many more countries are developing plans or have committed to begin recording in the near future. This motivated the ICAR working group for functional traits to prioritize foot and claw health and to work with internationally recognized claw experts to develop best practices for data recording. This collaboration is intended to complement existing research on specific aspects of the claws and feet of dairy cattle, focusing solely on the standardization and harmonization of data recording. The harmonized descriptions are the result of fruitful interdisciplinary collaboration among many experts with varying backgrounds (claw health experts, hoof trimmers, bovine practitioners, geneticists), ensuring comprehensive coverage of theoretical and applied needs. It is designed to provide a tool for practitioners and hoof trimmers and presents guidelines for the recording of important conditions affecting the claw health of cattle. Descriptive trait definitions are used to ensure that accurate classifications are made, which will support the collection of comparable and high-quality data within and across countries to support many activities (e.g., genetic evaluation purposes). The authors and contributors to the ICAR Claw Health Atlas hope that the compiled material will support the improved recording of foot and claw disorders and provide a valuable tool for improving the health and welfare of dairy cattle. 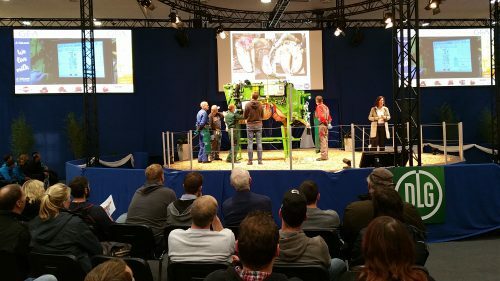 With in total 163,000 visitors, the EuroTier 2016 in Hanover, Germany, has sustained its reputation as the worldwide leading trade fair for modern animal husbandry and livestock management. As such, it was an excellent place to engage in increasing awareness of the great importance of claw health and of thorough and competent documentation of any findings in the claws of cattle. 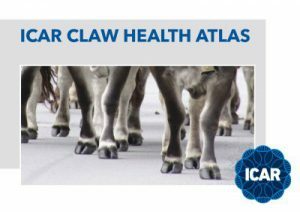 The International Committee for Animal Recording (ICAR) has published the ICAR Claw Health Atlas in 2015 as illustrated version of the new international reference for claw data recording, supposed to support identifying and documenting claw disorders. To disseminate knowledge of this new tool in practice and promote its use, the ICAR working group for functional traits has organized a meeting in the CattleForum and two practical demonstrations in the TopTierTreff. These events were supported by the Claw Health working group of the Committee for milk production and cattle management of the German Agricultural Society (DLG) and well-known claw experts from Germany and abroad. The aim was to bring together practice and science, including hoof trimmers, farmers, veterinarians and animal breeders. The great participation in the events and the success of the accompanying poster campaign reflected the importance of such open dialogue which will allow developing a constructive and efficient collaboration in improving claw health. The ICAR Claw Health Atlas has soon after its introduction become part of the education and training of hoof trimmers. Furthermore, it has already been implemented in the electronic documentation systems – in Germany in the form of the new national key for claw data recording, the ‘DLG Klauenschlüssel’ which has recently been revised according to the ICAR standard. These developments may have contributed to the big interest in information and teaching material: Thanks to the generous sponsors H.W. Schaumann GmbH, dsp-Agrosoft GmbH and vit PC-Software GmbH, posters with the German and English versions of the ICAR Claw Health Atlas could be printed and freely distributed at the EuroTier 2016 – for teaching, for use directly in the stable, and for better understanding of what the hoof trimmer or veterinarian had found and documented. This offer was very much appreciated by the visitors, so the 1,500 posters were all handed over within only two days, and the organizers were already approached with the first requests how and where to order further copies of the posters. The contact email address for asking a high resolution files for printing of special editions of the atlas is provided here. In the practical demonstrations of hoof trimming on Tuesday and Thursday, the large audience could clearly see that professional trimming is much more than just shortening the claws and that well-trained, certified hoof trimmers are working on a high level and quality standard. Mobile electronic recording systems with special software facilitate the detailed documentation on an individual animal basis and allow immediate use of the claw data. And with the right equipment, routine documentation during the trimming is feasible and very helpful. This was excellently shown with cows in hoof trimming chutes by the team of the university of Leipzig, Germany, and the professional hoof trimmers around the veterinary practitioner and claw specialist Dr. A. Fiedler. The presentations on Friday afternoon continued with giving insight into what can be done with systematic recording and analysis of claw data: The usability of accurate records of claw disorders goes far beyond appropriate treatment of the individual animal. They can be very valuable for identifying potential for improvement of husbandry and management and by that contribute to improved claw health, animal welfare and profitability in dairy farms. Furthermore, breeding applications support population-wide reduction of the incidence of lameness and of lameness-causing claw disorders. The international speakers and participants of the panel discussion agreed in their clear message that high-quality claw data are pre-requisite for targeted improvement measures and that the new ICAR standard for claw data recording can serve as valuable tool for collecting such high-quality data. To fully exploit this potential, it is now important to continue with the successful cooperation across countries and disciplines which allowed elaborating the standard and compiling the atlas for claw data recording. The events at the EuroTier 2016 have enabled an open exchange, some of the guests had made considerable efforts to join, and now the dialogue must be continued and extended to a close und mutually beneficial collaboration. Just on the next day, the ICAR Claw Health Atlas could be presented at the veterinary conference organized by the German Association of Veterinary Practitioners (bpt). This allowed underlining its potentially important role for working with claw data und raising the awareness of the bovine specialists of the high value of reliable and coordinated engagement. The international initiative of the ICAR working group for functional traits and collaborating claw experts in connection with the EuroTier 2016 has succeeded in bringing together relevant stakeholders and starting an important dialogue. Shared interests and goals give reason for confidence that words will increasingly be followed by actions, implying mutual support in the continuous work on improving claw health in cattle.